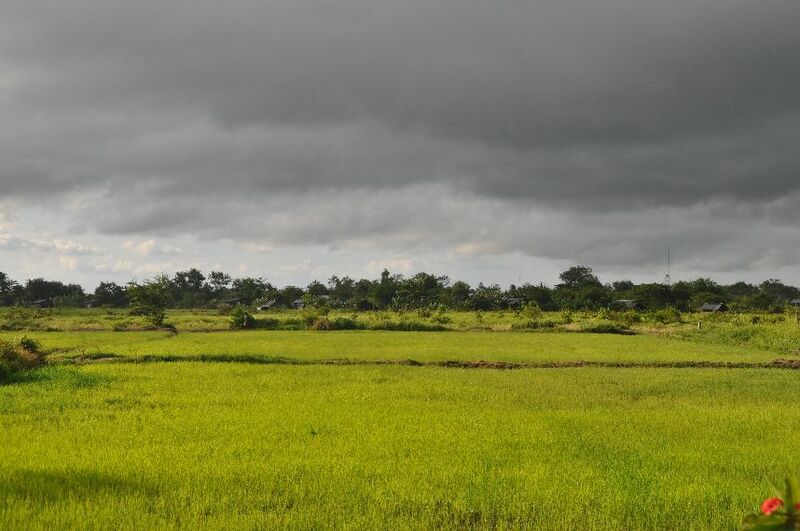 On July 21 I asked people to pray that it would not rain in Poipet. 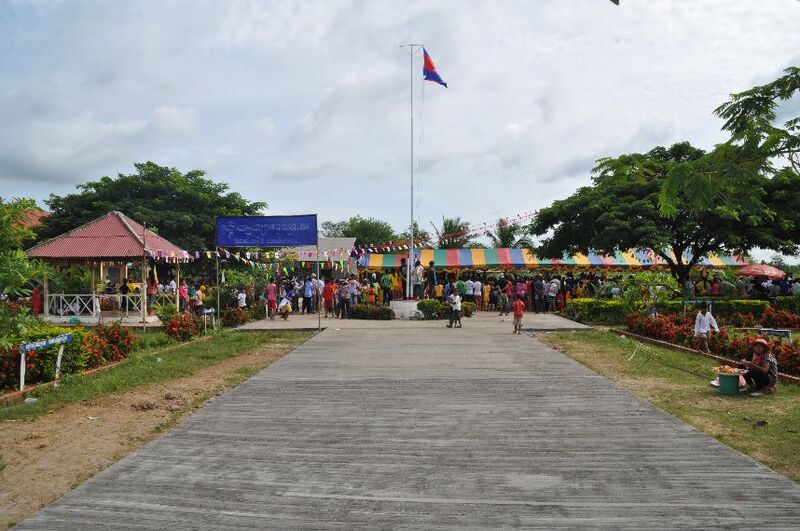 As part of our community development, we have been rehabilitating schools. 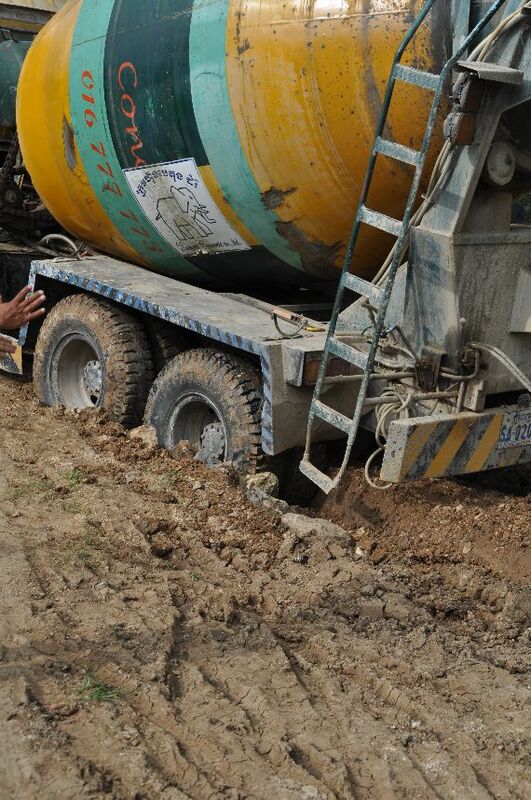 The schools were damaged by rain and floods, so to fix them, we needed dry weather. 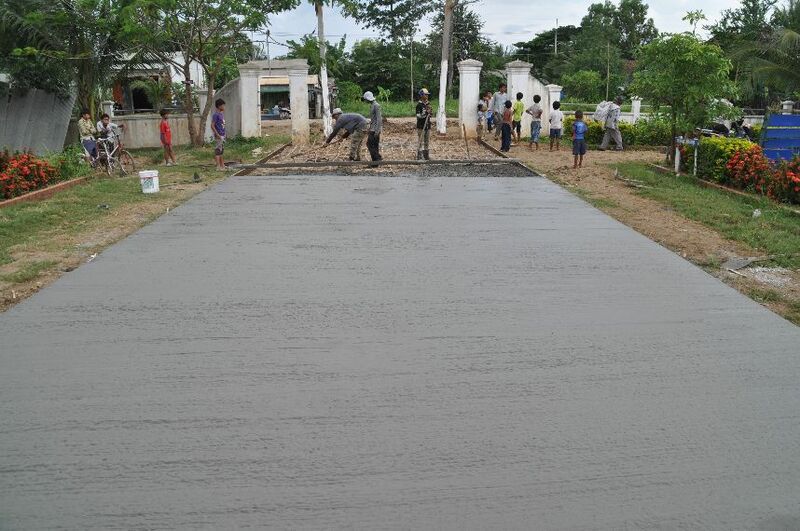 Specifically, we were pouring concrete at one school to make a driveway and walking paths between the classrooms. While concrete needs water to harden properly, it needs to be dry when you pour it or the concrete will separate from the sand and gravel and all you get is a pile of sand and rocks. From July 21 to 31 it only rained one time, right after our first concrete pour. 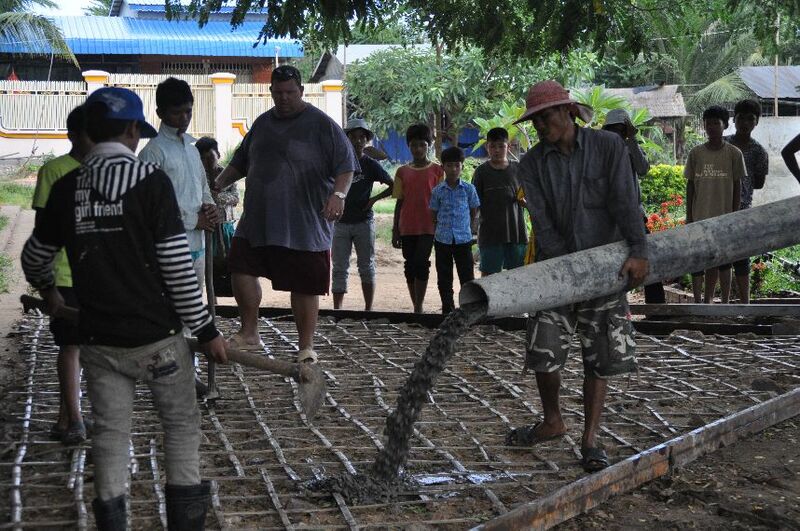 After 10 days we poured nearly 100 tonnes of concrete which consisted of more than 3000 square feet of concrete slabs. It was very hard work, but it gave us a chance to share about Jesus. 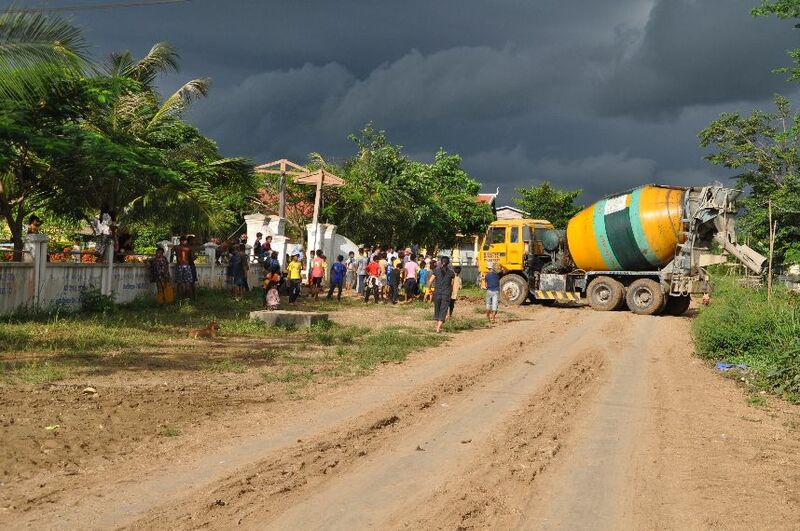 You may wonder, how does pouring concrete give you a chance to share about Jesus? Easy, because of Facebook! No, Mark Zukerburg is not a Christian nor is there anything Christian about Facebook. I simply used Facebook as a step of faith. I announced to my more than 1500 friends that we needed prayer for no rain. Some questioned if I was crazy. Some questioned if I thought God really cared about rain? Many simply told me that in their area of the world there was not enough rain, so they hoped our rain would move to them. When I ordered 100 tonnes (8 cement truck loads) of concrete they thought I was crazy too. 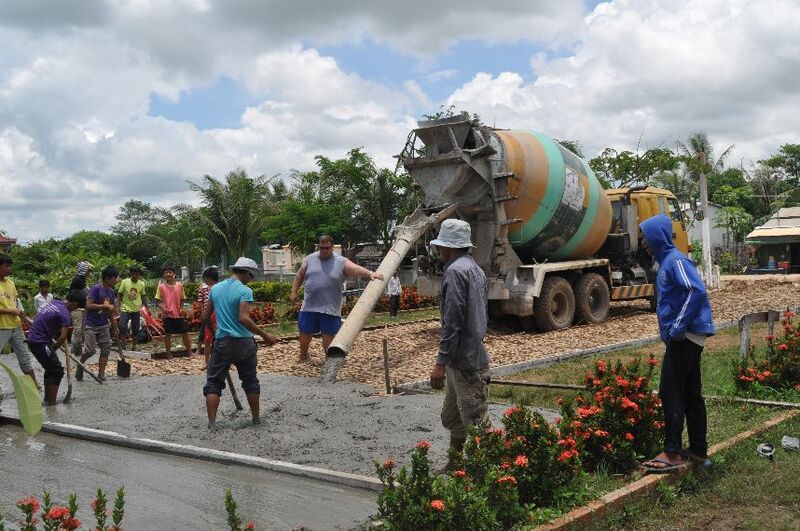 I could not pour the concrete in the rain and their trucks could not get to the work site because they would have to pass through 3 kilometers of dirt roads which if wet, would be too slippery and soft for the trucks to drive on. I informed the cement company that I was a follower of Jesus and thousands of his followers were praying for no rain, so to bring the trucks out. (They were Buddhist.) The weather called for 100% chance of thunderstorms every day. After all, this is our rainy (monsoon) season. Rain is a constant for months on end. Day one, they thought I was crazy, but it did not rain. By Day 5, they told me they knew only Jesus has power to stop monsoon rains! Even at one point when we could see heavy rain clouds coming in and a wall of water approaching, I thought my faith would break until the manager of the company called and said, “Don’t worry, the Lord Jesus will not let it rain.” It didn’t rain at our work site, though the rest of the town got rain. At the same time, the government television stations were announcing flood warnings and storm warnings in all of the surrounding provinces where we were working in Poipet. Even today, the government is calling for “emergency assistance” for Oddar Meanchey (North of us), Seam Reap (East of us), Battambang (Southeast of us) and Pailin (South of us) because of excessive rain. The storms cross from West to East with the prevailing winds this time of year. Every province surrounding us was facing floods and we were bone dry. I would call that a pretty clear miracle. On several occasions we would see the storms moving in from the West and stop right before us (within a mile of us) and then move North and South, pass over us, and continue raining on the Eastern side of where we were working. It was pretty incredible to watch. We never had a clear sky. Only one day was it sunny (and I got sun-burned), the rest of the days the sky was full of dark and heavy rain clouds. The clouds just didn’t release their water until they were passed us. I used Facebook and my conversations with the cement company to grow my own faith. I knew in my heart that Jesus could (and would) hold the rain back. It is one thing to believe it and not tell anyone, but I believed it and announced it to the world. That took faith. But why ask God for something (as some questioned me)? Doesn’t he already know our needs? We should ask because Jesus said, “Do not be anxious about anything, but in everything, by prayer and petition, with thanksgiving, present your requests to God” (Philippians 4:6). 11 Believe me when I say that I am in the Father and the Father is in me; or at least believe on the evidence of the miracles themselves. 12 I tell you the truth, anyone who has faith in me will do what I have been doing. He will do even greater things than these, because I am going to the Father. 13 And I will do whatever you ask in my name, so that the Son may bring glory to the Father. 14 You may ask me for anything in my name, and I will do it” (John 14:11-14). So I knew, that by asking believers to pray, Jesus could (and would) answer. So thank you Jesus for a wonderful miracle. Thank you Facebook for informing my 1500 friends! This was not a miracle because of Facebook, nor of Steve Hyde, but a miracle of Jesus requested by hundreds if not thousands of people who believed that Jesus could (and would) do a miracle in Poipet, Cambodia to glorify his name! Thanks everyone for praying! During this time the most comments I received were that, “we need rain!” Why not take a step of faith and publicly gather believers together to ask Jesus for rain? Put your faith on the line. All it takes is asking Jesus in faith! I think the pictures below will demonstrate that it was indeed a miracle! Nearly finished pouring 100 tonnes of concrete! Fantastic! Great witness to the Cambodian people! The school is greatly blessed by all of you who worked so hard. I am reading all of these and can only think of Isaiah and know He is the same God and He can do anything! Thank you for sharing this. I am praying that the Lord will send some strong men, including my husband if that be His will, to do some work. Tell me your next plans to pour concrete or build …so I can start praying now with specifics.